The Rolex Rainbow Daytona made a cameo appearance during Super Bowl 2019. You may remember Adam Levine’s tatted up, shirtless torso, but you probably overlooked his Rolex wrist bling. 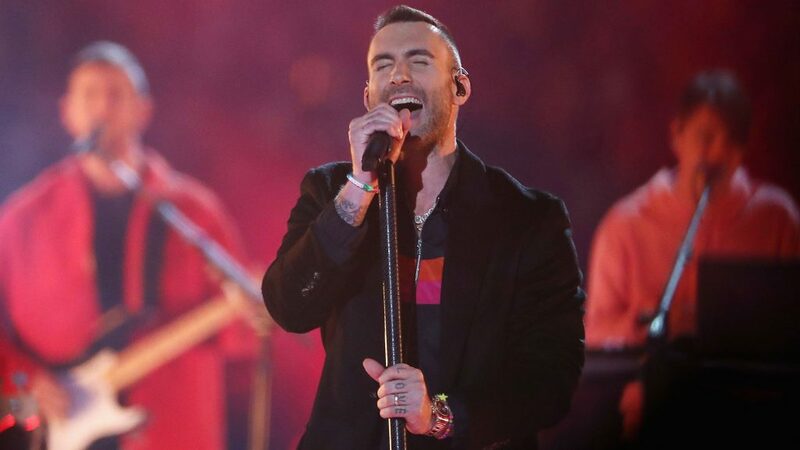 That’s right- Adam Levine donned the Everose gold Rolex Rainbow Daytona during his underwhelming halftime performance earlier this month. This particular model was released at last year’s Baselworld, and has received a lot of recent publicity. 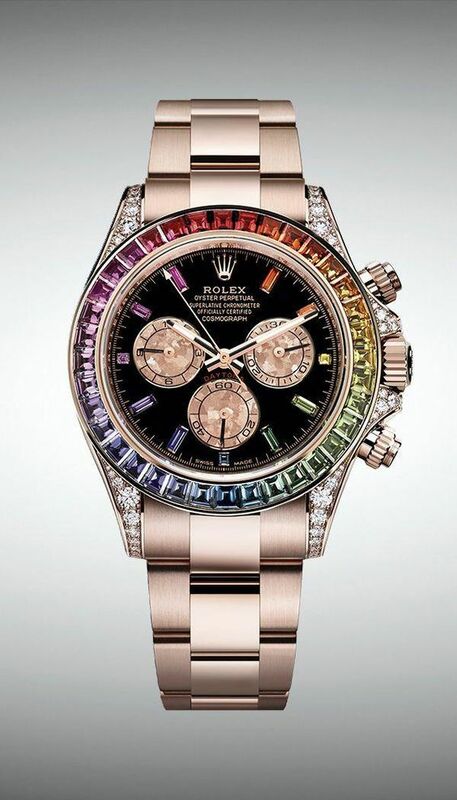 The original Rolex Rainbow Daytona was released in 2012 to an almost immediate cult following. Rolex shocked and awed collectors with this spectacular version of the reveled Cosomgraph Daytona. A very limited number of Rainbow Daytona’s were introduced in both white and yellow gold, making it a highly sought after watch. The bezel featured 36 in-house, baguette-cut sapphires hand set in a rainbow graduation. To add even more wow factor, the mid-case boasts 56 individually set diamonds. THAT is major bling. An already iconic watch, the Cosmograph Daytona allowed professional race car drivers to measure average speeds up to 400 kilometres or miles per hour. Since its debut in 1963, its popularity has risen thanks to celebrities like Paul Newman, Victoria Beckham, Jay Z, and Ellen DeGeneres. Rolex again made waves with the release of the updated Rolex Rainbow Daytona at Baselworld 2018. This time the watch was showcased in Rolex’s own Everose gold, providing an eye catching color combination as smooth as caramel. 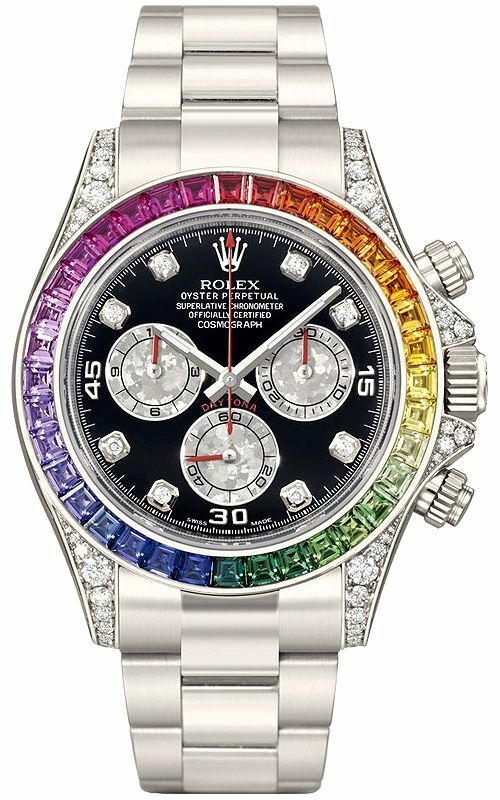 In just a year, the updated Rolex Rainbow Daytona has already increased massively in value. It retails for $97,000 but it sold for $246,013 at auction in November. First, the updated metal tone made a BIG impression on Rolex fans. Rolex’s impeccable quality is due in major part to it’s in-house production process. In the early 2000’s Rolex decided to patent its own pink gold alloy. Everose gold contains at least 76% gold and just over 2% platinum, while the pink color comes from copper. The addition of platinum ensures the rose gold color doesn’t fade over time. The chronograph counters are displayed as shimmering pink gold crystals. These are created during Rolex’s pink gold crystallization process. In lieu of the traditional tachymetric scale, the Rolex Rainbow Daytona boasts a total of 92 gemstones- 36 sapphires on the bezel and 56 embedded diamonds on the case. To ensure premium quality, Rolex employs its own gemmologists and gem-setters. Gemmologists comb through all gemstones during an intense inspection process, allowing only a pristine few to pass through to the gem-setters. These gem-setters place and fix each stone to perfectly enhance their beauty and sparkle on select Rolex timepieces. Some Rolex aficionados suggest the Everose Rainbow Rolex Daytona was the most sought after watch of 2018. There’s do doubt that interest in this particular Rolex will keep growing. Are you interested in purchasing your own Rolex Daytona (or any model), give us a call or fill out our contact form. Check out our Facebook page for box openings and watch reviews by our in-house watch expert Sergio Nuncio!